There are people who are picky about photos that are taken of them. When you take their picture, they want to see it, approve of it, and if they don’t like it they want it deleted. They want their hair looking just right, their face angled just, their body positioned just right and other nonsense. Every photo, every documentation of their life, their face, their being, they want to be perfect. They do not want any evidence showing that they were ever anything but a perfect version of themselves. There are even some who refuse to be in a photo because they hate the way they look. People need to realize that later on in life, even after their life has passed, its those imperfect photos that would have meant the most. I look at pictures of my mother, and the silly ones of her in her nightgown curling her hair or some other silly photo means the most to me. When I see photos like that I can hear her laugh, hear her telling me not to take another photo. There is so much more personality in those photos. They are so real and so much more full of life than the ones taken at the “perfect” posed moment. There are no memories attached to the traditional posed photographs, except maybe remembering how annoying it was to hold that smile. I remember being a kid on photo day. We would dress up in our fancy clothes, try not to get dirty at recess, have to make sure our hair was combed right when it came time to take the photo. Those photos did not represent us. I can look back at those pictures, and yes, they may look good, but they don’t show how we were as kids. I never ran around in a plaid vest, I never kept my hair slicked just right (granted as a hairstylist now, I might). I was a kid, I put on comfy clothes, I didn’t care how my hair was, I didn’t if my face was dirty. The photos of me like that? Those are the ones that really show who I was. I admit that I am guilty of wanting to have the right look in a photo, we all have a bit of vanity to us. However, we need to keep the other pictures as well. They capture us, our life. They can capture what everyone else saw on a daily basis. Our friends, our families, the people who we enjoy being around are not always perfect. It is the imperfect moments that matter most, that have the most character, that represents us. No one is perfect, and that is what makes everyone special and important. That is why we choose to have them in our lives, for those imperfections that make us smile. Be grateful for everyone you encounter. They say that being grateful is one of the easiest ways to cause happiness. So, its easy to draw up a list of good people in your life that you are grateful for. Your family, your friends, you pets, the coworkers you like. It can grow to be a decent sized list to go over mentally daily and be thankful for. It is important for you to show them your gratitude as well, simply by thanking them out loud increases the affirmation and reminds them the effect they have on your life. This, in turn, would likely increase the bond between you and these people and lead to you being even more grateful. All of that makes sense, and definitely should be done. I like to dig deeper into the “being grateful causes happiness” concept though. 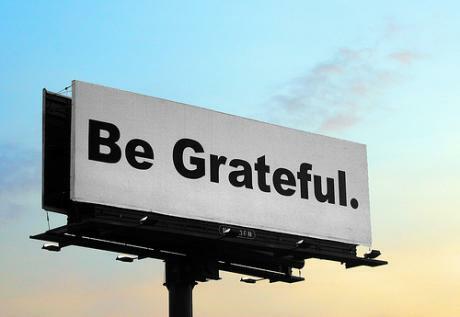 I think we should take it to the next level and literally be grateful for everyone we encounter. Strangers that are nice should be added to the list. We are often caught up in the flow and speed of the day that we do not notice the things that people do. We should slow down and take the time to notice and appreciate all the things that are said or done by people we do not even know. Now, I would also like to add to the list the people we encounter that we do not like, that do bad things, that just simply add some friction to our lives. That coworker that everyone hates, be grateful for. That driver that cut you off on the highway, be grateful for. That rude person in the store, be grateful for them too. I know it doesn’t sound logical, but I am completely grateful for all of those types out there. It goes back to a previous post I have made. We can take lessons from these people. We see how they act and it helps keep us in check about how we are acting. Their presence slows us down a bit and because of their contradiction to the good things, it helps us appreciate the good and positive people in our lives. 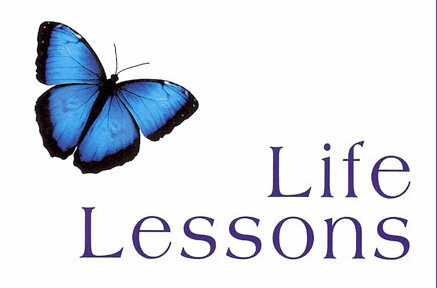 If everything and everyone was pleasant, it would lesson the value we place on the good things and people in our lives. So I am grateful for that coworker that everyone hates, because they can help me appreciate the ones that I enjoy. The rude drivers or people in the store help make the nice ones stand out so much more. Not to mention, it simply feels better to be grateful for them rather than wasting energy on complaining about them. So, seriously, take the time and be grateful for everyone you encounter. Too often we get distracted from the present moment and place that we are in and cannot fully appreciate it. I have come across many people who are so focused on their past that they cannot appreciate their present. These are people who are constantly telling stories of where they have been, what they have done, what they used to look like, who they used to date, a job they used to have, a skill they used to use and so on. They get so wrapped up in who they used to be, that they take away from who they are. Often this leads to them being depressed about who they are now. Maybe they aren’t as young, or as thin, or they are single, or don’t have a job as good as they used to. They are constantly comparing everything about their current life to where they used to be in life. When they do this, it makes it hard to see all of the good things that they do have and all of the good qualities that they do have. It often leads to bitterness and regret, wishing they still had their old life, and wishing they could go back in time and change things. Sometimes these people are focused on mistakes they have made, or events that they wish went differently. We cannot change the past, we can only learn from it and move on. I am not saying to completely forget about your past, but do not focus on it, do not let it take away from the present, do not compare it to your current life, and do not get stuck living in the past. Other people (and sometimes the same ones) do the same thing about the future. They get so wrapped up in the future that they cannot appreciate who and where they are now. These are the people who are constantly talking about what they will do when they have enough money, when they lose enough weight, when they get a different place to live, a job they plan to have, the man or woman of their dreams and so on and so forth. They hurry through their day and life trying to get closer to where they want to be. They get stuck living in a dream world that isn’t even here yet, and honestly may not even happen. They set themselves up for disappointment if it doesn’t happen how they plan. This type of thinking can lead them to really hate their current life because they are not where they want to be. It can discredit all of the good things and qualities they have because they are comparing it to a fantasy world. It is good to dream and it is good to plan for the future. It is not good to get so wrapped up in it that you rush through your daily life trying to get there. 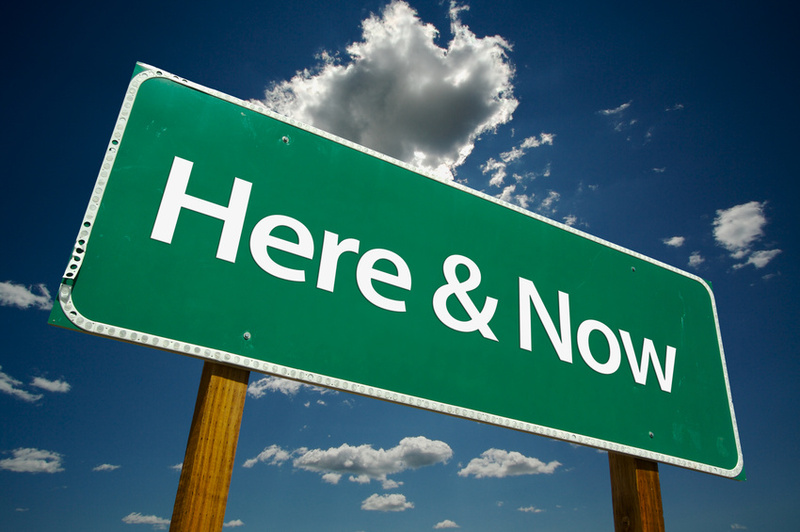 When you focus on the here and now, you can appreciate the life you have. You can notice all of the good things about yourself and your life that you would not notice or give credit to if you were comparing it to the past of future. Focusing on the here and now helps you to notice all of the little things in life that make it worth living. The things about yourself that are good, the people and places in your life that make you happy all pop into view when you are living in the moment. The past is who you were and helped create who you are today. They future is who you will be, and is created by who you are today. Keeping the future and past in mind can help you make good decisions in your life, and motivate you to do things today. Just do not let them overpower the moment you are living in. You cannot change the past and the future is unpredictable, but the here and now is completely up to you and under your control. In other words, it is the ability to put yourself in someone else’s shoes. So often we are quick to judge someone else. They do something, and we immediately jump to conclusions about that person, or we get defensive, or we criticize, get angry, laugh at them, or blow them off. We dismiss the idea that anything else is going on in their world besides that one moment of action. We do not know what is going on in someone else’s life. We do not know what has happened to them that day, that week, that month, or even that year. Humans have emotions, and those emotions can make us act in ways that are not always the best. A week or two ago a lady was turning into a parking lot. She had to cross two lanes of traffic to do so. I was driving straight in the lane closest to the parking lot and she came shooting over and almost hit my car. I had to swerve into the parking lot and do a u-turn to avoid being hit. Now, I could call the girl a crazy broad, be angry that she almost hit me, yell at her, complain to all of my friends about this b*tch that needs to learn to drive. I didn’t do any of that. I could see the lady was scared, she was obviously upset. First of all, an accident is called an ACCIDENT because it is not done on purpose. I highly doubt she was planning to try to hit my car. Any number of reasons could have been behind her doing what she did. There are millions of possibilities as to why she was in a hurry. She could have been needing to get to the grocery store to get medicine for a sick person, she could have just been dumped by a boyfriend, had a family member or friend die, or any other of a million reasons. It is not my place to assume the worst of her. There was no harm done, and I simply waved saying it was okay, I forgave her and moved on with my day. I have a friend who can appear not to care when something upsets you. He will laugh and joke about the situation and tease you, tell you to “grow a pair and get over it.” I could easily say that he is a jerk and doesn’t care about my feelings. Or, I could be a little more empathetic. Maybe that is his way of dealing with things? Maybe it is easier to joke about everything because he doesn’t know how to talk to someone in a crisis, or doesn’t understand how you feel. This same person would give you the shirt off his back if it was needed, stand up for you in a fight, protect you physically. We all have ways of expressing our feelings, and sometimes we just have to look at the whole picture instead of just a corner of it. 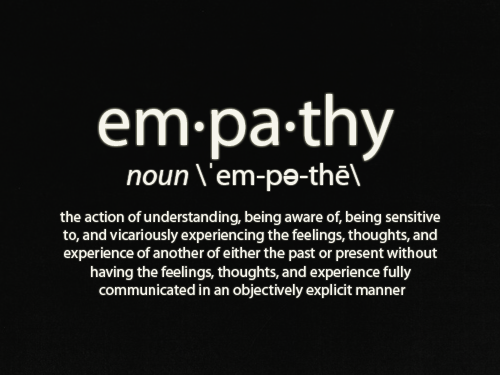 The ability to be empathetic and to see things from someone else’s point of view is an amazing trait. If it is used I think we can be so much happier and more positive. It can be hard not to jump to conclusions in this day and age with all of our previous prejudices and life experiences. We have had so many encounters with other people, and the things that they have done we apply to new situations and new people, despite the fact that they might not be acting based on the same reasons someone else had. Our brains naturally see patterns and puts things in categories. Enough experience with a certain type of person or situation, and our brains will catalog and try to put them in the same group, then apply it to every person similar to those interactions and every event similar to those experiences. Think of all the people you make decisions about before you’ve even talked to them. Think about all the times you have judged a business based on someone else’s review, or your own encounter at another location. Think about all the times you have gotten angry because of the way someone was driving. There are a million different examples of the way we jump to conclusions in a single day. From the moment we wake up to the moment we go to sleep we are jumping to conclsions. Sometimes we are jumping to positive conclusions, and sometimes we are jumping to negative conclusions. What if we didn’t jump to conclusions for just one day? What if we saw everyone we encountered as a new person, with new reasons for doing things? What if we didn’t judge the world based on past experiences? What if we took each moment as it was and got all the facts before making a decision about it? I think this could open up a world of possibilities. That dirty “creepy” looking guy you avoided in the store could have been a nice person, just getting in town from a crazy long trip and needed some things before going home. 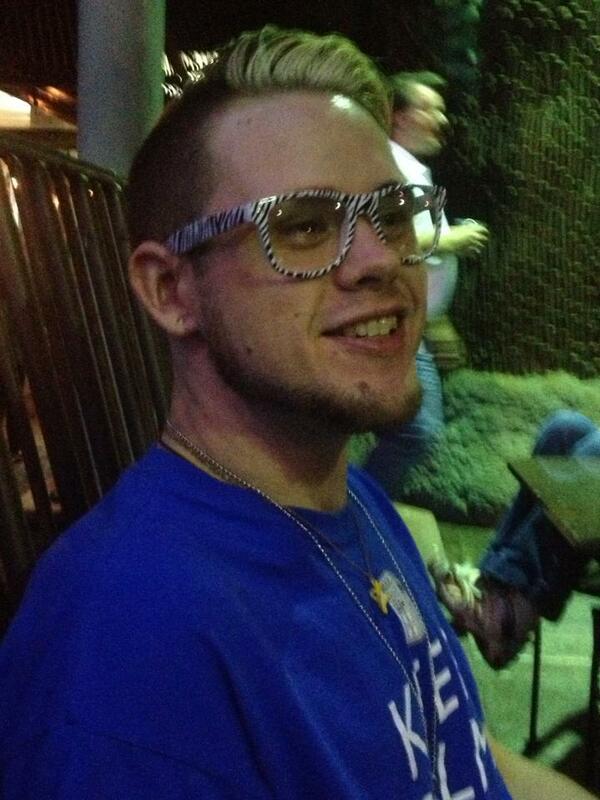 That “thuggish” looking guy at the bar could actually be the most caring and generous man in the room. The person of a certain nationality might actually tip you for their haircut. That restaurant could have had better food and better service than the other one you went to, or the review you read online. That person slamming on their breaks could have been trying to avoid an animal. I’m not saying be completely trusting and invite strangers into your life. Of course, we need to have some common sense. However, by not jumping to conclusions we can find out for sure what that person is all about. This goes back to what I am always talking about: how does it feel? It doesn’t feel good to think negatively about people or places or things. So, why think negatively without a real reason? Isn’t it better to be open-minded? If we don’t develop an opinion before the facts then things will work out better. If we judge negatively about something and then find out otherwise, we feel guilty. So, we feel negative about them first, then shocked maybe happy when we find out the truth, then negative because of the guilt. When we pre-judge positively and find out otherwise, we can open ourselves to them hurting us, and anger at ourselves. 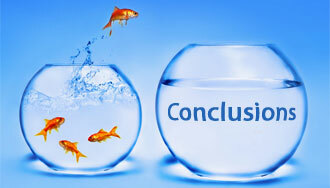 For a week now, I have been making the conscious decision not to jump to conclusions. It is wonderful how many negative emotions and feelings that do not happen when you do this. No flash of road rage, no tensing up in a store near a certain “type” of person, no feeling of dread about certain customers in my salon, no creeped-out feeling from guys in a bar. Obviously, not jumping to conclusions will not get rid of all the bad in the world, or al the negativity in your life. It will get rid of some though, and open the door to a world of possibilities. Anything you want is possible. Anything you want out of life is possible. That is a major whammy of a statement, but it is so incredibly true. No matter what your goals are, they are obtainable. The key is truly wanting it. If you truly want it, are willing to work for it, willing to sacrifice for it, willing to change for it, you can get it. A lot of the time we can have goals, but we do not truly want them, so they remain unattainable. If you truly want them, you will find a way to make them happen. After 27 years of being obese and wanting to be healthy, I finally realized that I wasn’t truly wanting it. I would make attempts, but honestly they were halfhearted. I wasn’t willing to do the work, the research, the sacrifice to get what I wanted. When we are ready and willing to do what it takes to make a change, it will happen. Once I truly wanted it, the excuses went away, the laziness was replaced with dedication, I stopped depending on others and will-power started growing. I have lost over 130 pounds of fat. That is an entire person. It is an enormous change in my body. Weight loss and becoming healthy are some of the hardest challenges in someone’s life. It is possible. I am not where I want to be yet, but I am so very close. I have come a long way, and my goal is in sight. It has been a lot of work, but as I get closer I realize that it is so worth it. Anything we want is just like my weight loss/health journey. Once we research and accept what needs to be done, set a plan, and work hard at it, everything just falls into place. Whether it is a health goal, a career goal, a spiritual goal, a relationship goal, it is attainable. How often have we heard this? How many memes are there about this? Are we just laughing at the picture of a cup of coffee with that saying on it? Lately I have seen this saying everywhere. Do we ever actually stop and think about it though? Do we look for the little things in life, and truly enjoy them? Do we let them make the impact in our lives, in our memories that they should, if we really enjoyed them? A little over a week ago, I decided to keep a “Good things Journal.” Not A journal listing every detail about my day, but only 1 good thing a day. I list only the good thing, no strings attached no “despite BLANK, BLANK happened,” only the good thing. I did this to keep things in perspective. At the end of each day, I simply write one good thing that happened. Some days it has been big fun moments like going to a baseball game, but some days it has been something small, something little. Glancing through my Good Things Journal, I am reminded of all of the good things that have happened. Those little things are in ink. They are forever written down and cannot escape my memory. This has proven to not only end my day on a positive note, but has given me a chance to truly appreciate and enjoy the little things. They were big enough to write down, and I can revisit those moments and enjoy them again any time I wish. If we were to ask different people what “little things” they enjoy, I am sure there would be a wide variety of answers. The fact that each of us have that little something that we individually enjoy, makes those things even more special and meaningful. I think it is more than that though. I think we need to examine the little things we take for granted. The things that don’t happen everyday and the things we see and just pass by without notice. I posted on my facebook the other day about watching this women coming into my salon. She got out of her car and headed for our door, but on the way she paused, she turned and looked at the newly blooming lavender flowers outside. She literally stopped to smell the flowers. It took just a moment, but she smiled afterwards then proceeded to come in and get her hair done. Those are the little things I am talking about. It isn’t something we go out of our way to seek out, to buy to enjoy, but the little things all around us that we would normally pass up because we are in a hurry. The look and the smell of those flowers put a smile on her face. When was the last time you have done something like that? I know it had been forever since I have taken the time to do so. Since that day though? I smell every flower I come across, I look into the sky to enjoy the beauty of it, I stand still and take in the feel of the soft breeze, the smell of the air after rain, the warmth of the sun. Those are the little things that I think can help make our day better. So, in short, enjoy the little things.